Soldiers of the People's Liberation Army's anti-chemical warfare corps, wearing gas masks, examine a container at the site of last week's explosions at Binhai new district in Tianjin, China, Aug. 16, 2015. 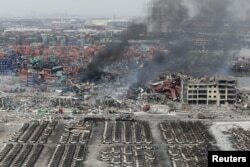 China confirmed Sunday that sodium cyanide, a toxic chemical, was stored in the warehouses devastated by massive explosions last week in the port city of Tianjin. Shi Luze, chief of staff of the People's Liberation Army's Beijing Military Region, said more than 100 tons of the deadly chemical was stored in two locations within the blast site. 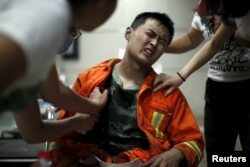 Chinese officials also said Sunday the death toll from the blasts has risen to 112. At least 21 firefighters are among the dead, state media reported. More than 700 people were injured and nearly 100 people are missing, including 85 firefighters. A firefighter reacts as he receives treatment at a hospital after the explosions at the Binhai new district in Tianjin, China, Aug. 13, 2015. Chinese Premier Li Keqiang was in Tianjin on Sunday, visiting those injured and displaced by the disaster. Chinese authorities have ordered a mandatory evacuation near the site that devastated an industrial neighborhood in the northeastern city. Chief of Staff Shi said that 3,000 soldiers had been dispatched to the disaster zone to clean up any leaks of hazardous materials. Local residents are concerned about the toxins contaminating their water supply. Angry relatives of the missing firefighters and local residents whose homes were destroyed by the blasts also showed up at a government news conference Sunday to demand information and accountability. Greenpeace, the environmental activist group, said Sunday it had tested water in several locations around the site and did not find any high cyanide contamination levels. Smoke rises among shipping containers next to damaged vehicles as firefighters try to put out a fire after explosions on Wednesday night, at Binhai new district in Tianjin, China, Aug. 14, 2015. However, the activist group called on China to conduct a "comprehensive survey" of hazardous chemicals in the air and water supply, and for the results to be made public. Residents, frustrated with the lack of news about their loved ones, protested outside City Hall, demanding information about their family members. The Beijing News on Saturday said all people within a 3-kilometer radius of the warehouse explosion site are being forcibly evacuated from the area because of a possible chemical contamination. Sodium cyanide was detected east of the site, according to police cited by the paper. Residents hold up a banner which reads: "Refugees from Qihang Apartment Complex appeal" outside a hotel where officials held daily media conferences in northeastern China's Tianjin municipality, Aug. 16, 2015. ​A team of more than 200 military nuclear and biochemical specialists has been searching the area for possible dangerous chemicals. The official Xinhua news agency says anti-chemical warfare troops rescued a man Saturday 50 meters from the blast core area. The People's Daily said the 50-year-old man was rescued from a shipping container around 2 p.m. local time, nearly three days after the blasts. Hundreds of people remain hospitalized after the Wednesday night explosions at the hazardous materials storage facility in the largely industrial neighborhood in China's fourth-largest city. Investigators still do not know what caused the initial fire or explosions, which sent gigantic fireballs into the night sky and powerful shockwaves that shattered glass several kilometers away.